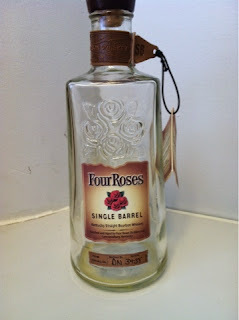 As my first foray into the Four Roses brand, I went with the Four Roses Single Barrel. This is a higher proof bourbon, coming in at 100 proof. The nose certainly indicates as such, hitting the nostrils with a heavy burn. However, on the tongue, while that burn is there, it’s not as overbearing as I expected it to be. Don’t get me wrong, it’s a “sipping” bourbon through and through. But, it is full-bodied and full-flavored, making any lingering alcohol burn hardly noticeable. The palate is sweet, with strong chocolate, vanilla and toffee and flavors coming through. I also noticed a bit of cinnamon, backed by a present but not strong wood flavor. The finish is a nice blend of citrus and spice. The spice and wood tones, lingered long after, as did a hint of the chocolate flavor providing just enough sweetness to leave me desiring that next sip as soon as I could get it. The body (and I don’t talk much about the body) was exactly what I look for in a whiskey. Somewhere right in the middle of watery and syrupy. It’s full-bodied without feeling sticky. This whiskey taught me two things: (1) I need to try other Four Roses offerings, including some of the private select bottlings, and (2) absolutely great whiskey can be had without breaking the bank. Because I can find it nearly anywhere and at a nice price, this is now my go-to bottle.